Boasting some good old fashioned Canadian "rural revenge" plot elements, Skull: A Night of Terror is a sporadically interesting Canadian thriller from Jerry Ciccoritti and Robert Bergman's Lightshow Communications. Ciccoritti and Bergman had previously collaborated on 1985's low-budget high-torture curio Psycho Girls and 1987's vampire tale Graveyard Shift, but Skull finds the pair moving past their dabblings in the horror genre, with Bergman taking over directing duties. Robert Bidamin (National Lampoon's Senior Trip) makes his feature film debut as David King, a skittish cop whose past inexperience with firearms resulted in the preventable deaths of his partner and a hostage. Because of this horrific incident, David hates guns, but apparently not enough to actually dispose of them in his basement he keeps a big chest full of uzis, automatic rifles, and police specials. Instead, David prefers to practice his deadly aim with a bow and arrow in the backyard of the isolated farmhouse he shares with his wife Jennifer (Nadia Capone, A Whisper to a Scream) and their two children. Enter the titular Skull (Robbie Rox, The Dark), a heavy-set, bald, one-eyed serial killer who is one of three inmates being transferred between jails a routine job assigned to David and his new partner Neil (Paul Saunders). 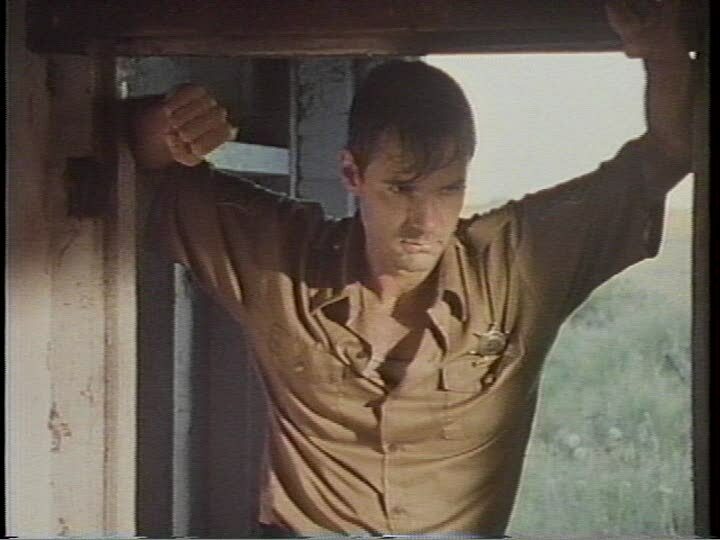 In the midst of the transfer, David foolishly pulls the prison truck over to help a woman having car trouble an obvious trap that allows Skull and his fellow cons to escape, and gets Neil shot in the leg. After a brief chase during which David refuses to radio headquarters, Skull seeks refuge in David's nearby home. Luck is definitely not with David that day while he's chasing down escaped serial killers, Jennifer discovers that he has been having an affair with Neil's girlfriend Sarah (Bonnie Beck). As Sarah looks on, trying to explain that it's over between them, Jennifer starts packing her bags. She's rounding the kids up in the car when Skull comes running up the driveway, and forces them all back into the house. When David and the badly injured Neil arrive, a shoot-out ensues, lasting until each runs out of ammo. Then, Sarah is raped by one of the convicts with a fabric fetish(!) and Skull tries to play "house" with Jennifer, and it suddenly becomes a race for the secret gun cache in the basement. 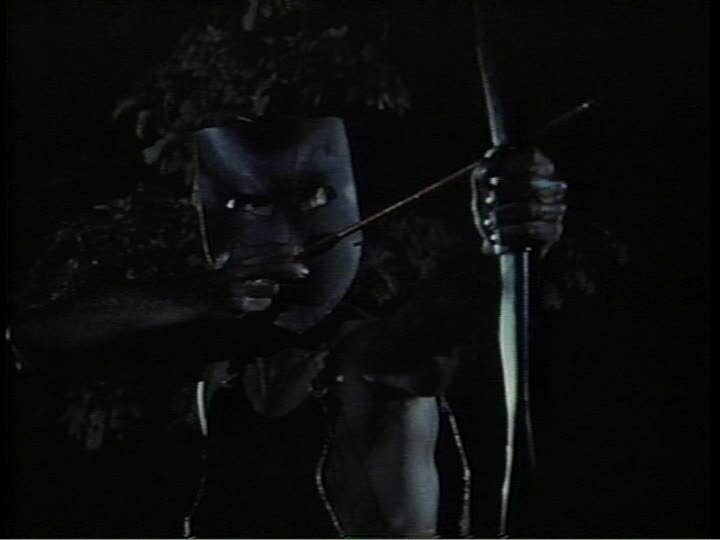 Unfortunately, Skull gets there first, prompting David to get creative: in the best scene in the film, our hero heads off to the tool shed to make body armour out of shovels and other garden implements, and with his bow and arrow, starts taking the thugs out one by one. The unlikely coincidences and the brazenly sensational plot can all be chalked up to good exploitation fun, however the undoing of the film is in tough guy Skull's Achille's heel he's afraid of the dark. David exploits his weakness in an ending continues to deliver some unique thrills, but ultimately the idea of a serial killer who can only get the job done if there happens to be a lamp in the room really becomes too silly to get past. Despite the same kind of leering camerawork seen in Bergman's messy follow-up, A Whisper to a Scream, Skull is successful enough from a technical standpoint. The picture clicks along for the most part, and the special effects are adequately done. In fact, the film is loaded with as much gunplay and explosions as possible no other Canadian action film comes close to discharging as many blanks as Skull and David do in their epic confrontations. The locations, in Peterborough, Ontario, are completely appropriate, recalling the remote Canadian settings of the rural revenge films of the 1970s. While at first the good and evil characters seem very clear-cut in Skull, throughout the course of the film David and Skull find they have much more in common that they are comfortable with. This is a common plot device in Canadian films, seen in everything from Death Weekend to The Silent Partner, possibly reflecting our own deepest feelings towards our southern neighbours. In this case, Skull and David seem to envy each other's situations Skull, in some twisted way, wants a family, and David, in an equally twisted way, wants to sleep with his partner's girlfriend, wear metal masks and shoot people with arrows. Despite the strangely simplistic characterization that undermines whatever lingering credibility the film might have had, Skull: A Night of Terror provides a nice take on the "rural revenge" subgenre. A minor, but generally enjoyable Canadian thriller.